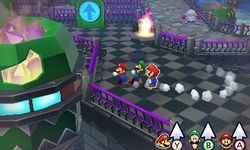 Neo Bowser Castle is the final area that appears in Mario & Luigi: Paper Jam. After the Bros. defeated Bowser Jr. and his paper counterpart in Bowser's Castle, the castle takes off and appears in the sky above Mount Brrr. It can be reached by climbing a winding staircase made of Paper Toads from the mountain summit. The castle shares the same name as the final dungeon in the previous game, and is most likely a reference to it. Neo Bowser Castle has the same general appearance as its counterpart earlier in the game, with the exception of various rocket engines holding parts of the castle in the sky. These engines are attached to some cardboard terrain that surrounds the castle walls. Inside the building, much of the layout is identical to Bowser's previous castle, with the exception of open sky replacing the earlier lava pits, and the lack of the internal Dream Vines. The castle is divided into two main floors, which can be accessed via up and down buttons near the entrance. Once these are hit with the hammer, the central plaza will either move up to the higher level (from which the final tower and battlements are accessible) or down to the initial one. After Bowser Jr.'s defeat, the two Bowsers activate the rocket engines on the castle, which lift it up into the sky. At this point, the castle's main cannon is used to destroy Princess Peach's Castle, and the party is blasted off the balcony by Kamek. Once Mario, Luigi and Paper Mario reach the summit of Mount Brrr, they use the Paper Toads to form a bridge up to the castle, which they used to enter. The remaining Paper Toads then become Toad Trail, Mario's last Bros. Attack. Inside, the trio encounter Nabbit for the final time, chasing him down throughout the building to gain Mega Thwonk, Luigi's final Bros Attack. They then navigate the various rooms to reach the second floor, where they encounter Toadette with the papercrafts from earlier. After seeing these destroyed by the new Papercraft Bowser, the group hunts down Fire Ore from around the building, using it to build a new Papercraft Fire Mario to defeat Papercraft Bowser. This then leads to the bridge to the next area being destroyed, and the Bros. have to navigate the surroundings room to repair it. However, once this is done, the castle's biggest cannon is charged up and readied for a final attack on Peach's Castle, which the Bros. break before proceeding. Before they can enter the main tower though, the Bros face the two Kameks in battle. Defeating them quickly to move on, they progress forward, encountering the Koopalings who are battled consecutively (Wendy O. Koopa and Roy Koopa, then Larry Koopa and Ludwig von Koopa, and finally Morton Koopa Jr., Iggy Koopa and Lemmy Koopa at the end). The trio then face off against the two Bowsers, with a second battle against their new merged form, Shiny RoboBowser. After this, Bowser is knocked into the distance and Paper Bowser is trapped in the book. While the castle is absent in the ending, the credits sequence implies that the castle eventually lands in its original place as the Papercraft Parade passes through it. If the player hasn't done any of the expert challenges for any of the enemies from Bowser's Castle, they can be battled right on one floor next to the dash floors for the player to finish them. Most items missed by the player during the first visit to Bowser's Castle can be collected here. This page was last edited on April 14, 2019, at 15:01.